turn-around times are for real! A confluence of two words, Development and Operations, the portmanteau, DevOps is a culture that puts development and IT operations in the same boat. This method improves IT service delivery with both teams working together for continuous development, testing, feedback and deployments. Organizations want to have a balance between conflicting concerns of swift releases and stable systems. DevOps is a philosophy to congregate these two conflicting priorities and achieve more synergy between groups and create an outstanding outcome. Employing this philosophy shifts our mind-set about our separate roles and responsibilities, provides a harmonious in-team connection and makes the end-result more worthwhile. With 14 years of industry presence across multiple verticals, Carmatec is well-positioned to offer customized solutions to all our customers. Do get in touch with us to learn more. Devops is a culture that puts development and IT operations in the same boat. This method improves IT service delivery with both teams working together for continuous development, testing, feedback and deployments. In today’s rapidly evolving and competitive business ecosystems, there is a constant need for improved reliability, faster delivery and incorporating complex, novel features in an app or software. When customers demand swift changes in functionality, the traditional way of doing things doesn’t equip us with the right tools to deal with frequent changes and demands. You need an accelerated delivery of service using agile principles and reduced delivery cycle times. This cannot be done without the help of a flexible operations team. This would be very difficult if your development team is oblivious to the IT requirements for code implementation. DevOps helps in bridging gaps in traditional development-IT relations and you get your much-needed focus on collaboration, automation, monitoring and increased throughput in delivering applications. Carmatec offers you various DevOps services through its InstaEdge program to help you kick-start your DevOps journey. With our extensive industry experience, we have bespoke solutions for our clients. Join us and experience the allure of DevOps, first-hand. InstaEdge brings an edge starting from your ideation state to the final launch of products. We bring you a full-fledged plan, which envisages cross-departmental collaboration, architecture & environment design and sets up processes with a solid workflow for continuous delivery and deployment. This helps you meet the reliability and quality expectations of customers. 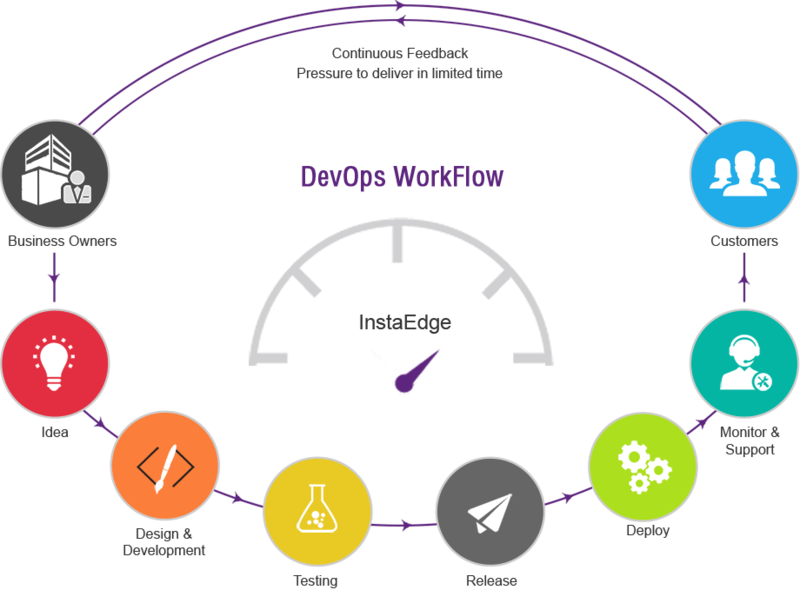 DevOps team is continuously engaged with the ops team throughout the lifecycle of the application that is constantly tested and deployed. Using configuration management tools like Puppet, Chef and CFEngine. Performance and stability is a vital aspect of quality. Continuous integration using agile development practices as a high-quality working solution. A DevOps team can manage minor code modifications and improvements more efficiently through Continual Integration. We have skilled and certified IT professionals who can monitor and support your DevOps environment and applications, Incident management, event-service-process log, monitoring using advanced performance logging and monitoring tools like Logstash, New Relic, Nagios etc. With 14 years of industry experience and exposure to diverse areas in IT and software development, Carmatec has positioned itself as a mature organization which walks the talk and provide customized, end-to-end solutions.